Languages: English, Portuguese, French, Italian, German, Spanish, Nederlands. 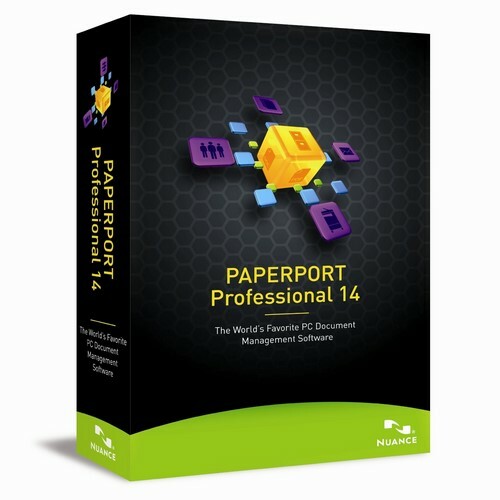 Put Paperport Professional 14 to work for you. Stop misplacing files and forget wasteful printing, faxing and mailing. Combine fast, easy scanning with PDF creation to simplify your document management. PaperPort Professional 14 is your complete solution for scanning, converting, organizing, assembling and sharing documents and photos on your PC or on the go. - Organize all of your scanned documents, photos, and over 150 document formats, as large, clear thumbnail images. - Powerful search combines the ability to quickly find files based on their appearance to ensure you find what you are looking for, fast. PaperPort's All-in-One Search leverages Nuance's industry-leading OCR technology to let you easily find scanned paper, PDF documents and even digital photos anywhere on your local PC or network. - Content of your scanned documents and image files is accessible to search engines like Windows or Google Desktop Search. - Just enter keywords or phrases to search and find files quickly and easily. PaperPort Professional 14 includes the Nuance Cloud Connector, powered by Gladinet, which adds connectivity to over 20 online services. Also route documents from digital copiers and MFPs as well as manage documents across the Network. - Easily move files to and from various cloud-storage services while Paperport adds powerful scanning and PDF capabilities to the mix. - Get the most out of your investment in networked multifunction printer/copiers and move mountains of paper to any desktop. - Send and receive documents to and from a shared network folder or Microsoft SharePoint. PaperPort Professional 14's document thumbnails, page thumbnails and revolutionary Split Desktop enable you to pull apart and reorder pages as well as merge all your documents into new PDF documents just like shuffling real paper. - Drag and drop to combine scanned documents with pages from PC applications, including Microsoft Word, Excel and PowerPoint, to create custom PDF documents. - Drag and drop the new PDF to your email icon and you're ready to hit send to share it with whomever you please.